The following chart shows the natural log of the 10-Year Treasury Yield. When using natural logs, constant exponential growth (or in this case, decay) can be seen as a straight line. As such, I have added a straight trend line in red. 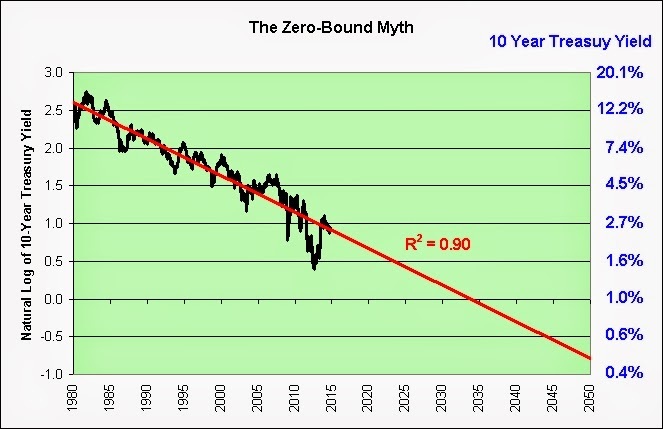 Note the very high 0.90 correlation. That's the declining path we're on (and we are currently right on it). On the right scale, I show what the actual yield would be for a given natural log value. Note the declining yields over time. Also note that the scale (in blue) would never reach absolute zero no matter how far out I look. We simply approach it. Unlike exponential growth, exponential decay can go on forever. There is no mathematical reason it cannot. 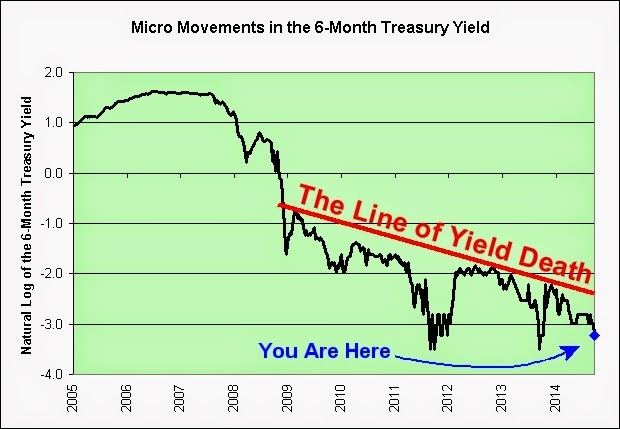 As seen in the chart, the 10-Year Treasury Yield as been exponentially decaying for more than 30 years. In theory, it can continue decay for many, many more years (just as it did in Japan after their housing bust in the early 1990s). In my opinion, those who argue that interest rates have nowhere to go but up over the long-term simply do not understand the process. Let me describe the process by offering an example. Borrow $100 at a 16% rate. You would pay $16 per year in interest. Borrow $200 at an 8% rate. You would pay $16 per year in interest. Borrow $400 at a 4% rate. You would pay $16 per year in interest. Borrow $800 at a 2% rate. You would pay $16 per year in interest. Borrow $1600 at a 1% rate. You would pay $16 per year in interest. If your goal (or the Fed's goal) is to pay $16 per year in interest, then how much could you borrow at a 0% rate? An infinite amount! Those arguing that we're at our limit must not understand this. Zero is hardly a limit, as it would allow infinite leverage! 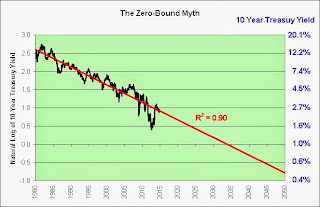 There are plenty of valid reasons to think that interest rates could rise, but The Zero-Bound Myth certainly isn't one of them. At 0%, an infinite amount of leverage could be applied, and infinity is a very, very big number. So what does this mean? They can pry the long-term treasuries (mostly TIPS for inflation protection) and I-Bonds from my cold dead fingers. That's what. As I have stated many times on this blog, it is and has been growing increasingly difficult to make money off of money (exponentially decaying interest rates are not good for long-term savers). For what it is worth, I do not see that changing in my lifetime. I say this because I believe that our economy has been decaying over the long-term under what amounts to an illusion of prosperity. Decaying interest rates reflect that decay. What is the answer to every economic mishap? Declining interest rates! All eyes on the Fed! The video is long. It will require patience to watch it. May it provide a calming moment in an age of instant satisfaction (think Mad Money and Fast Money). Moody’s latest estimations of pension liabilities are higher in every case than those reported by the systems. What are the odds that every case is off in the same optimistic direction? Wow! What an amazing coincidence! 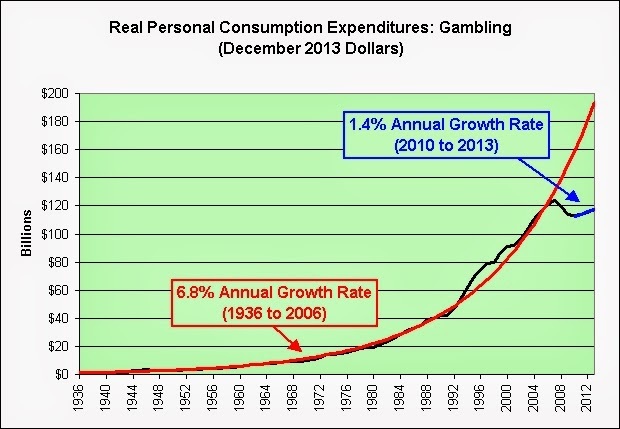 The following chart shows the annual real personal consumption expenditures for gambling. No wonder the economy is doing so poorly. We've run out of money to gamble. Don't worry. 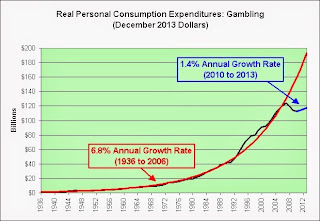 Gambling isn't quite dead yet. It's just being redirected. Say no more! Can't lose! Who do I make the check out to? In the financial markets, options and futures are examples of zero-sum games, excluding transaction costs. For every person who gains on a contract, there is a counter-party who loses. 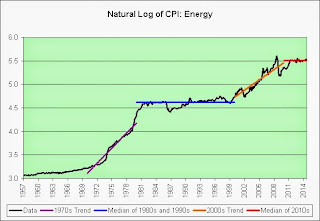 The following chart shows the natural log of the Consumer Price Index for Energy. When using natural logs, constant exponential growth is seen as a straight line. The prosperity bulls are convinced that we are reliving the 1980s and 1990s. 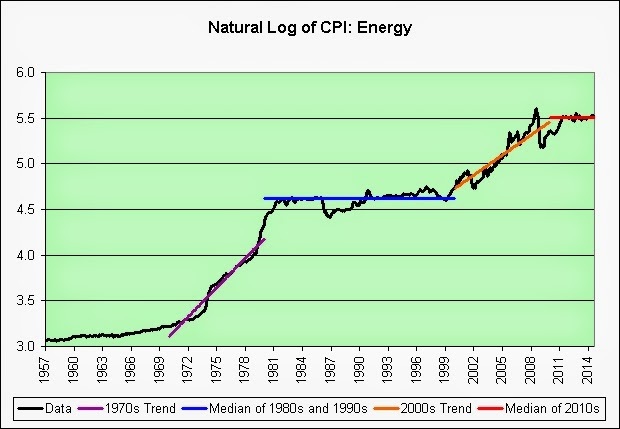 From an energy price standpoint, this chart would seem to confirm it. 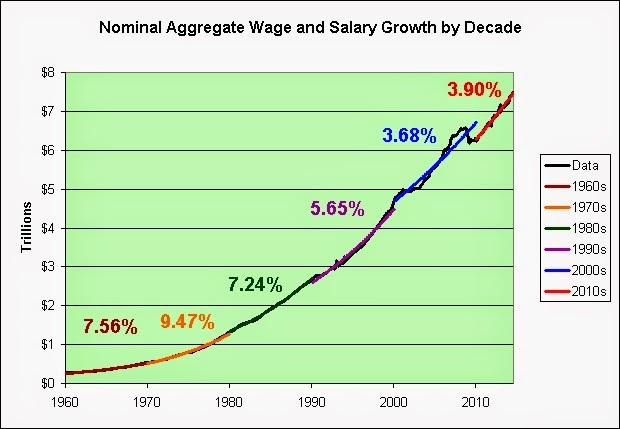 The 1970s saw a huge increase, and then there was no increase for the next 20 years. 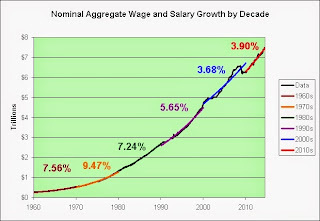 The 2000s saw a huge increase, and there has been no increase since. From a simplistic standpoint, this sure looks like a compelling prosperity theory to me. Maybe they've got a point. The 2010s seem a lot like the 1980s and 1990s so far. Call me stickler for details, but I do have a few concerns about the long-term theory though. Interest rates fell dramatically in the 1980s and 1990s. The inflation rate did too. I therefore have a few rhetorical questions on my mind. 1. Can we expect interest rates to continue to fall for another 15+ years or so? You know, so we can accurately relive the prosperous 1980s and 1990s in all their grandeur? Can we assume it will come with massively increasing debt loads? Leverage up, baby! 2. Will we see the inflation rate fall similarly? This pesky 1.7% annual CPI inflation rate seems so high. Let's bring it down a thousand basis points or so like we did in the 1980s and 1990s (compared to the 1970s). Making Sure "It" Does Happen Here! Big time!! 3. At what point will the Fed speak to us in Japanese? I do not recall them speaking to us in Japanese in the 1980s and 1990s. However, maybe it is different this time. For what it is worth, I will personally be looking for "Tora! Tora! Tora!" in the FOMC minutes. I will also be scanning for "I fear all we have done is to awaken a sleeping giant and fill him with a terrible resolve." That would be written in Japanese of course, so as not to spook the masses. It called for governments to promote more productive and rewarding jobs. Yes. Promote the @#$% out of productive and rewarding jobs! Why didn't anyone else think of that? Some sort of global ad campaign? "Up with more productive and rewarding jobs!" Or perhaps a plethora of automated government telemarketers could call us directly to inform us of the virtues of more productive and rewarding jobs? Yes, indeed. That's bound to work. Calling several times per hour would be greatly appreciated! As a side note, government telemarketing work should only be done by automated systems since the tasks are clearly unproductive and unrewarding. These are the kinds of jobs that humans do not want to do. There's nothing worse than a human telemarketer trying to hard sell the productive and rewarding job theory to a guy in the National Do Not Call Registry many times per day. Trust me on this. 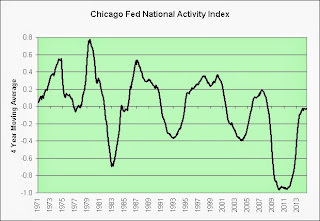 The following chart shows the Index of Aggregate Weekly Hours of Retail Production and Nonsupervisory Employees (2002 = 100). 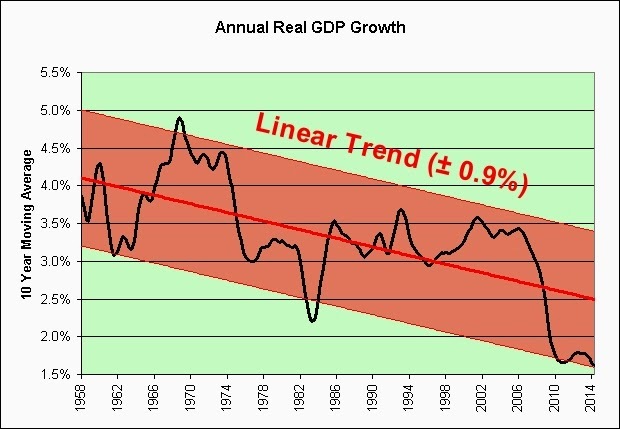 I have added an exponential trend line in red (January 1972 to January 2000). Employment of retail salespersons has traditionally grown with the overall economy, and this trend is expected to continue. 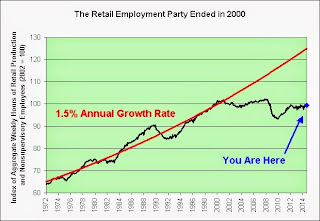 Population growth will increase retail sales and demand for these workers. The following chart shows the natural log of the Fed Funds Rate since 1984. When using natural logs, exponential growth (or in this case, decay) can be seen as a straight line. I'd be tempted to predict a rate between 1.0% and 3.3% based on the "Cone of Decaying Monetary Policy" channel (and using the inverses of the natural logs to predict the rate in the future). However, that would assume we can even get back into that channel and stay there for any appreciable length of time. 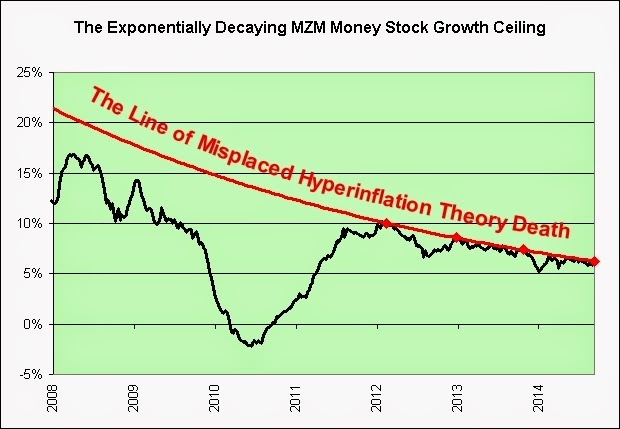 Can you say exponential trend channel failure? 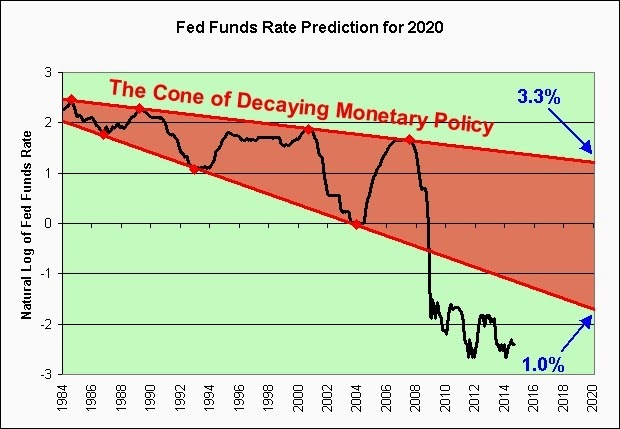 I therefore predict that the Fed Funds Rate at some point in 2020 will be a mere 0.25%. Think ZIRP + Japan. It just feels right (and oh so wrong). Can it go higher between now and then? Maybe, maybe not. The higher it goes the more likely a monster will be unleashed though. I have few doubts about that. The hyperinflationist poning will continue until morale improves. In all seriousness, ZIRP hasn't exactly led to hyperinflation in Japan either (at least so far). And why might that be? 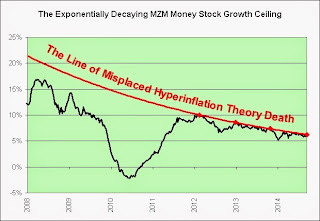 It is difficult to grow our $12.7 trillion MZM money supply when the average interest rate paid on it is a mere 0.075%. I know. Crazy theory. Sense a downward trend? 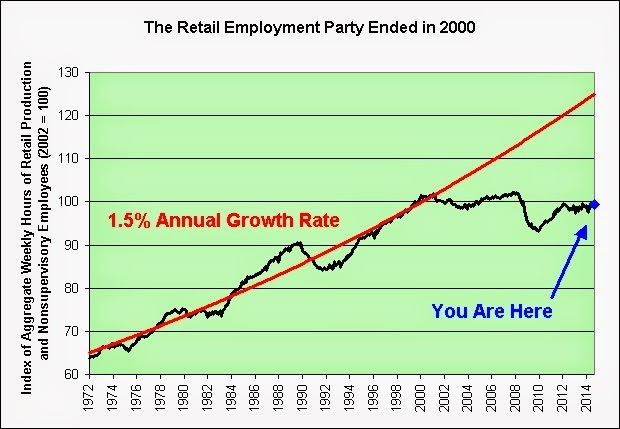 Is it any wonder that GDP growth is anemic and interest rates are so low? It isn't that the 2010s are extremely weak. They are. It's that wage growth in the 2010s is extremely weak even with rapidly falling unemployment *and* a complete lack of recessions (so far). We're barely beating the 2000s and that era had both a dotcom bubble *and* a massive housing bubble pop. Talk about setting the bar low. 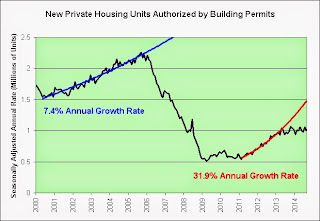 Will the 3.90% growth rate in the 2010s hold for the full decade? I believe that it would take a miracle to go another 5+ years without a recession. I won't be holding my breath. Let's just put it that way. 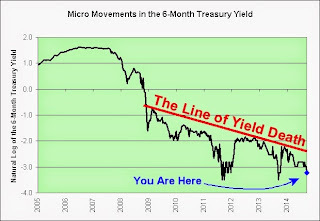 The following chart shows the natural log of the 6-month treasury yield. First, constant exponential growth (or in this case, decay) can be seen as a straight line. This makes it easier to see which way yields are growing and more importantly, how they are growing (or in this case, decaying). Second, using natural logs makes it easier to see the recent tiny movements in the nearly microscopic yields. As seen in the chart, there is little evidence that we shall be breaching the "line of death" anytime soon. We continue to drift away from it. Further, one might even argue that the bond market isn't expecting a robust Christmas season this year. Someone might argue that anyway and I certainly would not be the first to offer much in the way of a counterargument. I did manage to find someone who bought the breaching theory 5 months ago though. I absolutely love opinions stated as facts and what they must mean to me! Can't get enough! Rising interest rates have been the talk of Wall Street—and Main Street—for months. Months? Try years. Has this person been living in a cave since the Great Recession? Despite the recent fluctuation in yields, the return on ten-year Treasuries has climbed more than one-half percentage point over the past 12 months, to 2.7%, and Kiplinger’s expects yields to reach 3.5% by the end of 2014. There are just a few months left on the mythical 3.5% by the end of 2014 prediction. And while we are waiting for that, let me amuse you by describing the monkeys flying out of my, well, you know. Oh, yes. Here they come now! Very much the harbinger of higher real yields and renewed prosperity for all! Bottom yield monkeys for the win!! 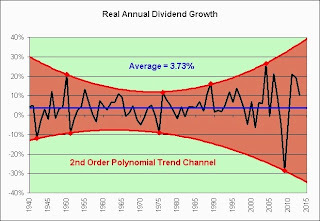 The following chart shows real dividend growth (adjusted for inflation) since 1940. I have added a polynomial trend channel in red (showing the growing anarchy) and an average in blue (3.73%). Yes, sir. This is just what soon-to-be retiring baby boomers need most. 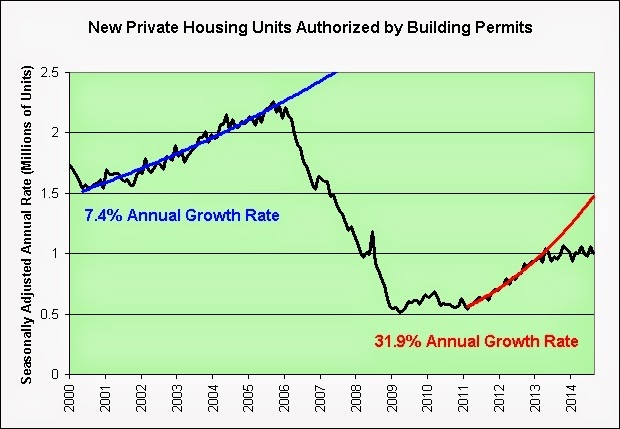 It's the kind of "steady" growth that only excessive leverage and/or risk taking can provide! Baby boomers need new shoes! 1. Three straight years well above the average! Woohoo! 2. No chance of ever returning to the mean! Woohoo! 3. Predictable and sustainable dividend growth from here! Woohoo! 4. Way to go Fed! Congratulations! You've won for all of us! Woohoo! Too much sarcasm? Have I crossed the line? The following chart shows the 10 year moving average of annual real GDP growth. I have added a linear trend in red and a channel to go with it (± 0.9%). 1. Why are we stuck at the bottom of the awful trend channel? 2. Is it any wonder that real yields have been falling for decades? 3. Where are we headed from here and why am I in this basket? "I am optimistic that we have appropriate policies in place to help the economy achieve escape velocity by 2014," he said, even as he acknowledged the downside threats to the economy from U.S. fiscal consolidation and economic troubles overseas. But beyond its crummy joke, the Fed has done something else: it has removed “Escape Velocity” – the economic surge in the US that has been falsely promised for five years in a row to rationalize soaring stock prices – from its vision of the future. 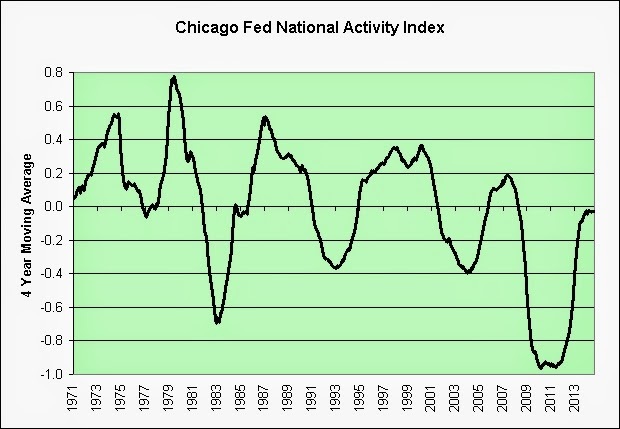 The following chart shows the 4 year moving average of the Chicago Fed National Activity Index. Can we work our way back to 0.0? So close and yet so far! Why do I have this uneasy feeling that the next leg will be down? 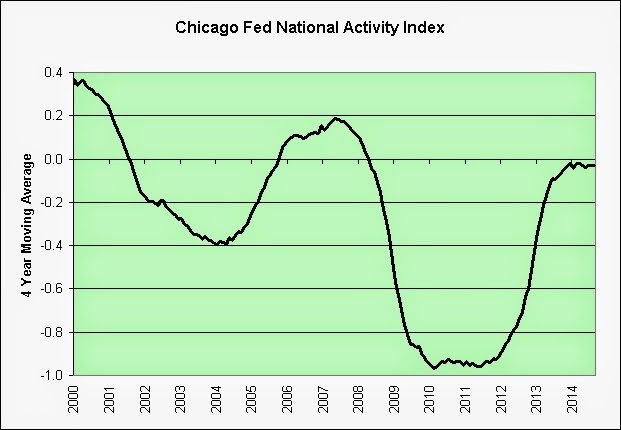 Put another way, our upward momentum seems to have tapered. Fed pun intended.